Ghana-based Benjamin Lebrave speaks fluent French and English, and can schmooze in Spanish and Portuguese. He’ll report on new African music every other week. This week, he writes about the Roots of Azonto, an initiative to record the first comprehensive soundbank of Ghanaian percussion and acoustic instruments. Have you ever watched the video for E.L.'s song "Kaalu"? At the beginning, you can hear a few bars of actual kpanlogo drums. It's unusual. 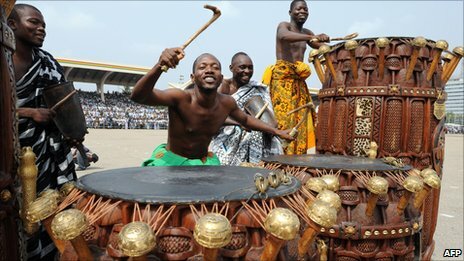 Even though a lot of the rhythms in popular Ghanaian music—whether it's azonto or something else—are heavily inspired by live drums, there is a deep divide between how Ghanaian pop music and live music are made and how they sound. Studios are multiplying in Accra. This means recording your song has never been this easy. Add to this diminishing profits for artists and anybody around them, and you find yourself with very, very cheap prices to record a song. There is little incentive to bring in live musicians for sessions. Every extra body in the studio means less cash for the beat-maker, who is already not making much. So you will hardly ever hear a guitar or a drum in a popular Ghanaian song, or rather, you will hardly ever hear a live instrument in one of the current pop hits played in loops on the radio here. I like bridging gaps, as you may have noticed from past posts, so I'd been asking myself about ways to reconnect mainstream Ghanaian recorded music with mainstream Ghanaian played music. Or in other words: how to link Fruity Loops with live drums. Fruity Loops is a weapon of choice used to conceive 99% of Ghanaian pop music. This is also the case with kuduro in Angola, coupé décalé in Côte d'Ivoire, and as far as I know, practically any form of dance music coming from either Southern edges of the Atlantic. Fruity Loops is easy to crack, easy to use, and as it turns out, it's real easy to use it to incorporate any kind of sample into a song or a beat. I thought about putting together a sound bank of instrument sounds here in Accra. I asked my friend, beat-maker and sound engineer Max Le Daron how he felt about it—he loved the idea. Then I asked This Is Africa how they felt about relaying the story, they were totally down as well, especially since this project fits well into the Fruity Loops column I write for them. Before you know it, Max is here in Ghana and we have a job to do. We called it Roots of Azonto, because azonto's roots are the rhythms of Accra, and because we intend to make azonto—a metaphor for Ghanaian music in general—more diverse by strengthening its roots—the little bits of sounds used to craft beats. For the past two weeks, Max and I have been roaming Accra. We've been recording a bunch of drums large and small, from finger bells to huge frontomfrom drums, and going to many of Accra's top producers to get their feel for the project, and for the prospect of incorporating drum sounds into their beats. Their enthusiasm, Max' recording ability and the drummers' skills have already made this project a huge success: I have no doubt a few of the next Ghanaian hits will incorporate some of the sounds we recorded. We still have one last recording session this Saturday with two artists previously featured in Lungu Lungu, percussionist Alidu and guitarist Kyekyeku, who can handle his own on a number of drums too. You can follow our adventures starting from day one right here, and on Twitter using #rootsofazonto.